The story of this wine begins with the recession of 2001. Farmers had a difficult time selling their fruit following harvest. At the same time, it was expensive to purchase this fruit ahead of time and bring it to market. In order to help their farming friends, Owen Roe decided to bring back the age old practice of “sharecropping.” Farmers would now take a share of the profits and a new partnership was formed. In recognition of this relationship, “Sharecropper’s” was born and this label has been successful ever since. 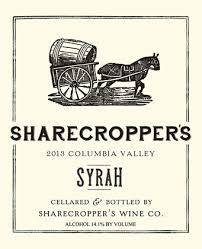 This 100% Syrah originates from the Columbia Valley. This wine is sourced from the following vineyards: Outlook, Destiny Ridge, Dubrul, Red Willow, and Union Gap. It is aged for 16 months in French oak. Sharecropper consistently puts out value wine. This is a fantastic bold fruit driven wine for a very reasonable price. You will pick up blackberry and candied cherries. The fruit just goes and goes from start to finish. Best served with BBQ and good friends! This certified organic blend of Colombard, Ugni Blanc, Sauvignon, and Gros Manseng originates from South West France in the appellation of Vin de Pays des Cotes de Gascogne. Grapes are gathered gradually allowing for vinification during good conditions. This organic blend is a refreshing dry white. If you like Sauvignon Blanc, this is must try wine. Super inexpensive for this quality of wine. You will get citrus and exotic fruit notes. It is refreshing. Best served as an aperitif or with light fare such as salami and mild cheese. Oh, and with friends! This blend of Tinta Roriz (55%), Touriga Franca (25%), and Touriga Nacional (20%) originates from the Douro DOC of Portugal. Rabelo, meaning “Roman,” is named in reference to the strong influence in the region. This wine is fermented in stainless steel and aged 50/50 in stainless steel and French oak for 10 months. This fantastic blend is fruit driven with lots of black raspberry, plum, and cassis throughout. It has a nice weight to it with spice that is flavorful but not overpowering. If you are bored with ordinary wine, this is a must try. Best served with any red meat, sharp cheeses, and good friends. 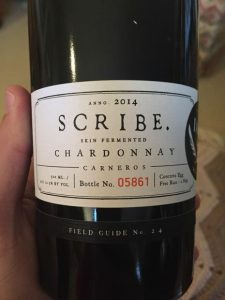 This 100% Chardonnay originates from Washington State. The Balancing Act is a new label under the umbrella of Tamarack Cellars. Ron Coleman, owner and winemaker, enjoys producing fun wines that are sourced from a combination of his own vineyards and neighboring vineyards. Hence the name, Balancing Act. This wine is unoaked. This is not your grandma’s Chardonnay! Super bright with green apple, pear, and banana. The absence of oak allows the fruit to shine from start to finish. You will also get a hint of honey and caramel if you really focus your palate. This wine is fantastic! Best served on a wonderful spring day on the patio with friends. This 100% Cabernet Franc originates from the Pheasant Hill vineyard in the Rogue Valley of Southern Oregon. This wine benefitted from a long and mild growing season. A warm spring coupled with little rain reduced yields and produced more concentrated fruit. 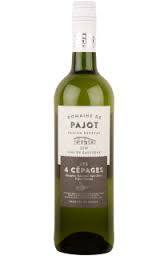 This wine is aged twenty months in mixed French cooperage two years old before being blended and bottled. New world Cabernet Franc at its best. Rhubarb pie in a bottle. You will get all kinds of exotic notes on this wine including elderberry, and Szechuan peppercorn. This wine is juicy. A bad Cabernet Franc tastes like Robitussin. This wine is the opposite of that! Best served with Lamb shank and good friends. This organic (practicing non-certified) 100% Chardonnay originates from the Los Carneros appellation of Sonoma, California. This wine benefits from an excellent growing season of temperate and consistent weather. This wine is manually harvested and the production is limited to 700 cases. This Chardonnay is green apple jolly rancher. Crisp and light for a Chardonnay. The absence of oak lightens it up and makes it more approachable. Careful, you may not be able to limit yourself to just one bottle. Best served with smoked salmon, cream cheese, capers, and with friends. 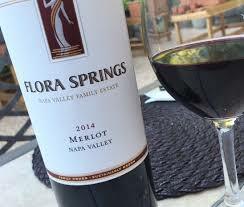 Merlot is that grape that you can have when you are in any mood. Not too big, not too light. This fruit driven Merlot is unbelievable. Plum, dark and cherry notes persist throughout with a hint of cinnamon. This is true “people pleaser.” Serve this to your guests and you will not disappoint. You can drink this wine with or without food. Best served with vegetarian pasta and friends.